My absolute favorite place while Grownin’ Up in Maine was on the Sebec River in Derby, and specifically the old swimming hole at a spot we called Down Back. A photo I took recently and shown here reminds me of summertime and the dragonfly, plus a tale my Mom told to help keep 8 kids in line. Readers may recall from a previous story that I related how as youngsters in the 1950’s and 60’s my friends and I invented our unique brand of swearing rather than use actual curse words. A couple of favorites were “sons o’ buckwheat” and “barroid”, and to this day I avoid cursing though must admit a less than perfect record. Where was the motivation? Swimming, fishing, and rafting Down Back we couldn’t help but notice the sheer number and variety of dragonflies. 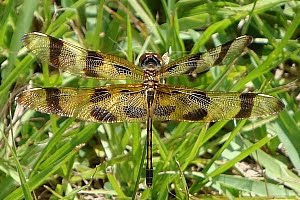 40+ years later I still recall being told by my mother, “Don’t swear or a dragonfly will sew your lips shut!”. What?! Moms don’t lie, right? Over time I’ve come to realize the truth and can’t help but think… Dear Mom, Good thing a dragonfly doesn’t sew lips for little white lies!